Background: The value of saturation prostate biopsy (SPBx) in patients without biopsy history remains controversial. Materials and Methods: A total of 644 consecutive suspected prostate cancer (PCa) cases without biopsy history were retrospectively grouped as 24-core transperineal SPBx (n = 368) guided by coaxial needle and prostate transperineal biopsy (PBx) (systematic 14-core scheme, n = 276). PCa detection rates were compared based on prostate-specific antigen (PSA) levels, PSA density (PSAD), and Gleason scores. Complications associated with those procedures were assessed. Results: Coaxial SPBx was superior to the 14-core scheme for overall PCa detection rates (39.67% vs. 24.64%), at PSA levels of 4.1–10.0 ng/ml (37.37% vs. 23.48%) or 10.1–20.0 ng/ml (43.31% vs. 27.21%), and PSAD <0.15 (47.80% vs. 29.23%) or 0.15–0.24 (34.07% vs. 20.93%) (all P < 0.05). In patients with positive biopsy, the rates of nonclinically significant PCa were comparable between the two biopsy groups. Conclusions: Transperineal coaxial needle SPBx as the initial scheme improves PCa detection compared with initial systematic 14-core PBx, without increasing complications and overdiagnosis. The incidence and mortality of prostate cancer (PCa) are increasing worldwide, and the mortality burden associated with PC is following that of lung cancer. Indeed, >25.3 new PCa cases are recorded yearly per 100,000 men worldwide. It is accepted that early detection and treatment of PCa should benefit the patients. Prostate biopsy (PBx) is the current gold standard method for PCa diagnosis in patients with high-serum prostate-specific antigen (PSA) levels, abnormal digital rectal examination (DRE) findings, or suspicious imaging. Since the 6-core sextant systematic PBx scheme proposed in 1989 by Hodge et al., variants including different PBx core schemes, core numbers, and biopsy methods (transrectal and transperineal approaches) have been developed. Nevertheless, a standard PBx scheme has not been established. Transrectal PBx is the most popular PBx strategy in clinical practice, but still has inherent challenges such as inadequate sample collection (especially from the anterior, apical regions of the prostate), and high infection risk. Interestingly, transperineal PBx provides a “clean” biopsy with lower numbers of infectious events and better sampling of the entire prostate.,,, Before May 2010, systematic 14-core transperineal PBx was used as the initial PBx scheme in patients suspected with PCa at our center. It is well accepted that higher diagnostic rates can be achieved by increasing the number of biopsy cores.,,, Saturation PBx (SPBx) was first suggested by Stewart et al., who detected PCa in 34% of patients with previously negative PBx. Therefore, we attempted to improve PCa detection rates by adding extra cores to the traditional PBx scheme. Saturation PBx,,, is currently recommended for the re-screening of suspected PCa cases with a history of negative PBx, due to the limitations of traditional PBx for PCa detection,,,,, and despite a higher complication rate associated with additional needle cores (such as hemospermia and urinary retention). The coaxial needle was first used for transperineal PBx in 2003 and reduces the invasiveness of repeated percutaneous punctures, resulting in a decreased frequency of adverse events with transperineal PBx. We hypothesized that the use of the coaxial needle during SPBx would not increase the frequency of complications related to PBx, even if more cores are sampled. Nevertheless, the clinical value of SPBx in patients without biopsy history remains controversial. Therefore, we retrospectively evaluated the benefits of the transperineal 24-core coaxial needle-guided SPBx as an initial PBx scheme in patients without PBx history. 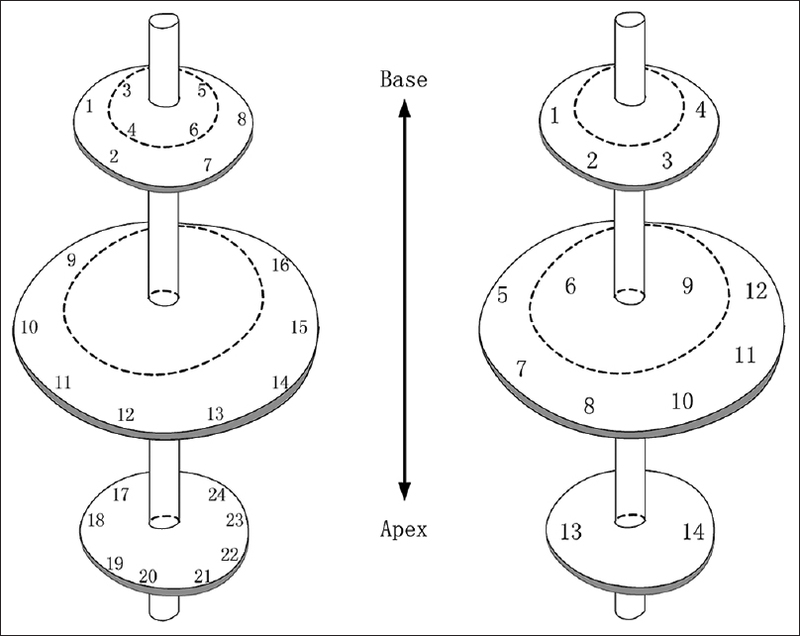 The 24-core transperineal coaxial needle-guided SPBx has been used as the initial scheme for PCa screening since May 2010 at the Beijing Friendship Hospital. The present study compared patient data obtained with systematic 14-core transperineal PBx (from January 2006 to April 2010) and 24-core coaxial needle SPBx (from May 2010 to August 2013) in patients without previous PBx history. PCa detection rates and the frequency of complications related to both schemes were retrospectively assessed. In this retrospective analysis, a total of 644 patients with suspected PCa without previous PBx history underwent a transperineal PBx procedure between January 2006 and August 2013 at the Beijing Friendship Hospital. Patients with previous negative PBx were excluded from the study. PCa was suspected when: (1) Persistent serum total prostatic-specific antigen (TPSA) levels were 10–20 ng/ml; or (2) TPSA was 4.0–10.0 ng/ml with free-to-total PSA ratio of ≤0.16;, or (3) suspicious DRE or magnetic resonance imaging (MRI). Patients with serum TPSA levels >20 ng/ml were excluded from the study. Starting on May 2010, coaxial needles were used for SPBx. Thus, patients were retrospectively divided into the coaxial needle SPBx (24-core SPBx, n = 368) and PBx (systematic 14-core scheme, n = 276) groups for transperineal PBx. The study was approved by the ethics committee of the Beijing Friendship Hospital. All patients were informed about the PBx procedure and potential complications. A single dose of levofloxacin (0.1 mg) was administered before the PBx procedure. Anticoagulants were discontinued for at least 7 days before PBx. Transperineal PBx was carried out by one of two skilled operators (FZ or QS). The patient was placed in the extended dorsal lithotomy position to minimize pubic arch interference. The procedures were performed under general anesthesia with propofol. The Tarason™ (C6612D6) ultrasound system with a 7.5-MHz linear biplanar transrectal probe (Tarason, Burlington, US) was used for ultrasound guidance. Biopsies were taken using an 18-G biopsy needle with a 22-mm depth. Starting in May 2010, SPBx has been applied at our center, and the biopsy procedure was also improved by using a 17-G coaxial biopsy needle (Bard Truguide, Bard, Germany). In the SPBx group, the coaxial needle was used by insertion up to the prostate apex before the biopsy. Target sample was obtained by removing the coaxial tip, with the guiding channel serving as repeated traumatic tunnel under real-time ultrasound guidance. Prostate volume was calculated using the following formula: Volume = width × height × length × π/6. Seminal vesicle and prostate characteristics were recorded under transrectal ultrasound (TRUS) guidance before the PBx procedure. The locations of PBx core are displayed in [Figure 1]. In the 14-core PBx scheme, three coronal planes of the prostate were determined under TRUS probe as base, medium, and apex, from which all cores were sampled: two cores (6 and 9) were obtained from the transition zone (TZ), and all other cores were obtained from the peripheral zone (PZ). In the SPBx scheme, the three coronal planes of the prostate were the same as for the 14-core PBx scheme, and eight cores per plane were sampled: four cores (3, 4, 5, and 6) were obtained from the TZ of the base and the remaining 20 cores were sampled from the PZ of all three coronal planes. Patient characteristics, including age, serum PSA levels, and prostate volume were recorded. Complications associated with biopsy such as gross hematuria, fever (≥38.5°C), and dysuria were recorded according to the Clavien-Dindo classification. PSA levels were measured using a specific enzyme-linked immunosorbent assay kit (Architect PSA, Abbott, USA), according to the manufacturer's instructions. Positive pathologic findings were classified as very low risk, low risk, and intermediate risk according to the National Comprehensive Cancer Network (NCCN) guidelines. In the present study, very-low-risk PCa was regarded as nonclinically significant PCa. Two physicians (Q. S. and F. Z.) were responsible for data collection. PBx slides were analyzed by certified pathologists at our center. All data were analyzed with SPSS version 16.0 (IBM, Armonk, NY, USA). Continuous data were presented as means ± standard deviation and analyzed using the independent samples t-test. Categorical data were presented as frequencies and evaluated using the Chi-square test. P <0.05 was considered statistically significant. The patient characteristics (age, initial serum PSA level, and prostate volume) were comparable between the two groups [Table 1]. Biopsy outcomes are summarized in [Table 2]. A statistically significant difference was observed in overall PCa detection rates between the two groups (SPBx: 39.67% vs. PBx: 24.64%, P < 0.001). PCa detection rates were assessed in three subgroups according to serum PSA levels. The PCa detection rates for the SPBx and PBx groups were, respectively, 25.0% vs. 16.0% (P = 0.509) for individuals with PSA of 2.5–4.0 ng/ml, 37.37% and 23.48% for patients with PSA levels of 4.1–10.0 ng/ml (P = 0.012), and 43.31% and 27.21% in those with PSA levels of 10.1–20.0 ng/ml (P = 0.005). 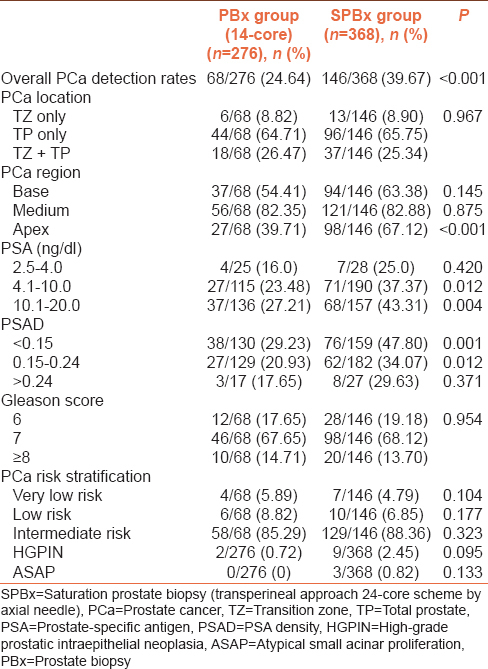 In addition, the detection rate of PCa was higher in SPBx patients with PSA density (PSAD) <0.15 (47.80% vs. 29.23%, P = 0.001) and PSAD of 0.15–0.24 (34.07% vs. 20.93%, P = 0.012). No statistically significant differences were found in PCa detection rates between the two groups for patients with PSA ≤4.0 ng/ml (P = 0.420) or PSAD >0.24 (P = 0.371). As shown in [Table 2], the PCa detection rates for TZ samples were comparable between the SPBx and PBx groups (34.25% vs. 35.29%, P = 0.967). On the other hand, PCa detection rates for apical region samples were higher in the SPBx group compared with that of the PBx group (67.12% vs. 39.71%, P < 0.001). The PCa detection rates for the samples from the basal and intermediate regions were comparable between the two groups. PCa risk stratification according to the NCCN guidelines can be performed to distinguish indolent from potentially aggressive cases. In the present study, the positive rates for very low risk (4.79% vs. 5.89%, P = 0.104), low risk (6.85% vs. 8.82%, P = 0.177), and intermediate risk (85.29% vs. 88.36%, P = 0.323) PCa were comparable between the two groups. No difference was found between the two groups regarding the Gleason scores in biopsy-positive patients (P = 0.954). High-grade prostatic intraepithelial neoplasia and atypical small acinar proliferation were found in 2.45% (9/368) vs. 0.72% (2/276), and 0.82% (3/368) vs. 0% (0/276) in the SPBx and PBx groups (P = 0.095 and P = 0.133), respectively. PostPBx complications, evaluated according to the Clavien-Dindo complication scale, are displayed in [Table 3]. Dysuria was the most frequent complication in all patients. Indeed, 59/644 (9.16%) individuals showed post-PBx acute urinary retention, and catheterization was required for 3–5 days, indicating a Grade IIIa class complication according to the Clavien-Dindo scale. The patients suffering from Grade II dysuria (74/644, 11.49%) were treated with an α1 receptor antagonist. Gross hematuria (grade I) was found in 124/644 (19.25%) patients and required no pharmacological treatment. Fever (≥38.5°C) due to postPBx infection was observed in 1/276 patient in the PBx group and was managed conservatively. There were no statistically significant differences in complications between the two groups and no patient required hospitalization. The SPBx scheme as the initial PCa detection strategy remains controversial. SPBx is generally recommended in patients with repeat PBx. In the present study, we found that our 24-core coaxial transperineal SPBx as the initial biopsy scheme improves the overall PCa detection rate compared with the systematic 14-core PBx (39.67% vs. 24.64%, P < 0.001). In addition, higher PCa detection rates in the apical region were observed in the SPBx group (67.12% vs. 39.71%, P < 0.001), probably due to the additional apical samples compared with the systematic 14-core PBx scheme. These data indicate the superiority of coaxial SPBx over systematic 14-core PBx for PCa detection in patients without previous PBx. Next, we conducted subgroup analyses according to the PSA levels and PSAD. Interestingly, the data suggest an advantage for coaxial SPBx as the initial scheme in patients with PSA levels of 4.1–20 ng/ml and PSAD ≤0.24, but no significant differences were observed in patients with PSAD >0.24 or PSA ≤4.0 ng/ml, which might result from the relatively small sample size of this study. Indeed, Li et al. found that SPBx significantly improved PCa detection irrespective of PSA levels. In addition, a systematic review of 11,997 participants who underwent TRUS-guided PBx or SPBx as the initial biopsy scheme indicated the superior efficiency of the SPBx scheme for PCa detection in this setting, especially in patients with low PSA/PSAD and high prostate volume, without increasing the frequency of complications and the number of nonsignificant cancers. PCa overdiagnosis is a major concern, although it was suggested that some degree of overdiagnosis must be accepted. In fact, PCa overdiagnosis generally means increased diagnosis of nonclinically significant PCa (also known as indolent PCa). Therefore, the NCCN PCa risk stratification was used in the present study to distinguish indolent from potentially aggressive cases. In general, the concept of very-low-risk PCa in the NCCN risk stratification is approximately equivalent to nonclinically significant PCa. SPBx has not been recommended as initial biopsy mostly due to the concern of overdiagnosis., In the present study, the rates of very low risk PCa were comparable between the PBx and coaxial SPBx groups. Those findings suggest that transperineal coaxial SPBx as an initial biopsy strategy improves the overall PCa detection rates compared with the systematic 14-core biopsy scheme, especially in people with PSA of 4.0–20.0 ng/ml and PSAD ≤ 0.24, without increasing the diagnosis of nonclinically significant PCa. Therefore, increased PCa diagnosis in the transperineal coaxial SPBx group should not increase overdiagnosis. In recent years, multiparametric MRI (mpMRI) combined with target fusion biopsy have been strongly recommended for repeat PBx and active surveillance, especially for patients with a Prostate Imaging Reporting and Data System score of 3–5. Zhou et al. Compared the accuracy of MR-guided prostate biopsy (MR-GPB) and template-guided transperineal prostate saturation biopsy (TTPSB) in 219 patients. The detection rates for any cancer (TTPSB: 39.7% vs. MR-GPB: 34.7%, P= 0.161) and clinically significant PCa (TTPSB: 34.7% vs. MR-GPB: 32.9%, P= 0.636) were comparable. MR-GPB can reduce the numbers of unnecessary biopsies and exhibits an efficacy comparable to that of TTPSB for the detection of any PCa and clinically significant PCa. In the present study, mpMRI was not performed in all patients due to the machine being unavailable at the start of the study. Actually, mpMRI and target fusion biopsy are still unavailable in many hospitals. The present study revealed that the 24-core transperineal SPBx scheme is strongly recommendable to detect clinically significant PCa in selected candidates for initial PCa detection, without the need for mpMRI. Dysuria is more common with transperineal PBx than with transrectal PBx. Interestingly, Pepe and Aragona reported that the incidence of acute urinary retention following transperineal PBx was directly correlated with the number of cores sampled, with frequencies of 4.3%, 7.1%, and 11.1% in cases with 12, 18, and >24 cores sampled, respectively. Here, the incidence of acute urinary retention (Grade IIIa dysuria) in the coaxial SPBx group was similar to that of the PBx group, probably due to the use of the coaxial needle. The transperineal coaxial needle, first introduced by Novella in 2003, was inserted up to the prostate apex and the target samples were obtained by removing the needle tip, therefore reducing the invasiveness of repeated percutaneous puncture and resulting in less adverse events such as urinary retention and hematoma in the perineal region. Gross hematuria with Grade I, occurring in 124/644 (19.25%) coaxial SPBx patients, was the most common adverse event. No sepsis was observed. According to Eichler et al., there is no significant benefit in using >12 cores for PCa detection and methods requiring >18 cores have poor side-effect profile, in disagreement with our findings. Some limitations of the present study should be mentioned. First, the inherent limitations of retrospective analyses are inevitable. The patients were not randomized and the two biopsy schemes were not performed at the same period; those are the main causes of possible bias. Second, the small sample size, especially in the PSA 2.5–4.0 ng/ml and PSAD >0.24 subgroups, weakens our conclusions. Finally, this was a single-center trial with potential selection biases. Therefore, multicenter studies with more patients are required to confirm the findings. In summary, transperineal coaxial needle SPBx as the initial scheme enhances PCa detection compared with systematic 14-core PBx scheme in patients with PSA levels 4.1–20 ng/ml or PSAD ≤0.24, without increasing the frequency of complications and overdiagnosis of PCa. The opportunity for the higher detection rate for clinically significant PCa in case of initial biopsy without mpMRI could be achieved using a transperineal SPBx. We would like to thank Dr. Min Cong for providing the artwork used in this paper. Howlader N, Noone AM, Krapcho M, Miller D, Bishop K, Altekruse SF. SEER Cancer Statistics Review, 1975–2013. Bethesda, MD: National Cancer Institute; 2016. Jemal A, Siegel R, Ward E, Murray T, Xu J, Smigal C, et al. Cancer statistics, 2006. CA Cancer J Clin 2006;56:106-30. Nelen V. Epidemiology of prostate cancer. Recent Results Cancer Res 2007;175:1-8. Nhung NT, Khuong VT, Huy VQ, Bao PT. Classifying prostate cancer patients based on total prostate-specific antigen and free prostate-specific antigen features by support vector machine. J Cancer Res Ther 2016;12:818-25. Nevoux P, Ouzzane A, Ahmed HU, Emberton M, Montironi R, Presti JC Jr., et al. Quantitative tissue analyses of prostate cancer foci in an unselected cystoprostatectomy series. BJU Int 2012;110:517-23. Hu Y, Ahmed HU, Carter T, Arumainayagam N, Lecornet E, Barzell W, et al. Abiopsy simulation study to assess the accuracy of several transrectal ultrasonography (TRUS)-biopsy strategies compared with template prostate mapping biopsies in patients who have undergone radical prostatectomy. BJU Int 2012;110:812-20. Nam RK, Saskin R, Lee Y, Liu Y, Law C, Klotz LH, et al. Increasing hospital admission rates for urological complications after transrectal ultrasound guided prostate biopsy. J Urol 2010;183:963-8. Noldus J, Graefen M, Haese A, Henke RP, Hammerer P, Huland H, et al. Stage migration in clinically localized prostate cancer. Eur Urol 2000;38:74-8. Hossack T, Patel MI, Huo A, Brenner P, Yuen C, Spernat D, et al. Location and pathological characteristics of cancers in radical prostatectomy specimens identified by transperineal biopsy compared to transrectal biopsy. J Urol 2012;188:781-5. Mabjeesh NJ, Lidawi G, Chen J, German L, Matzkin H. High detection rate of significant prostate tumours in anterior zones using transperineal ultrasound-guided template saturation biopsy. BJU Int 2012;110:993-7. Bittner N, Merrick GS, Butler WM, Bennett A, Galbreath RW. Incidence and pathological features of prostate cancer detected on transperineal template guided mapping biopsy after negative transrectal ultrasound guided biopsy. J Urol 2013;190:509-14. Li W, Mao S, Tu M, Ge X, Li K, Xie F, et al. Asthma and the risk of prostate cancer. J Cancer Res Ther 2018;14:S571-5. Chun FK, Karakiewicz PI, Briganti A, Gallina A, Kattan MW, Montorsi F, et al. Prostate cancer nomograms: An update. Eur Urol 2006;50:914-26. Liang Y, Han W, Yan H, Mao Q. Association of CYP3A5*3 polymorphisms and prostate cancer risk: A meta-analysis. J Cancer Res Ther 2018;14:S463-7. Stewart CS, Leibovich BC, Weaver AL, Lieber MM. Prostate cancer diagnosis using a saturation needle biopsy technique after previous negative sextant biopsies. J Urol 2001;166:86-91.
de la Taille A, Antiphon P, Salomon L, Cherfan M, Porcher R, Hoznek A, et al. Prospective evaluation of a 21-sample needle biopsy procedure designed to improve the prostate cancer detection rate. Urology 2003;61:1181-6. Guichard G, Larré S, Gallina A, Lazar A, Faucon H, Chemama S, et al. Extended 21-sample needle biopsy protocol for diagnosis of prostate cancer in 1000 consecutive patients. Eur Urol 2007;52:430-5. Jain D, Gupta S, Marwah N, Kalra R, Gupta V, Gill M, et al. Evaluation of role of alpha-methyl acyl-coenzyme A racemase/P504S and high molecular weight cytokeratin in diagnosing prostatic lesions. J Cancer Res Ther 2017;13:21-5. Chun FK, de la Taille A, van Poppel H, Marberger M, Stenzl A, Mulders PF, et al. Prostate cancer gene 3 (PCA3): Development and internal validation of a novel biopsy nomogram. Eur Urol 2009;56:659-67. Deras IL, Aubin SM, Blase A, Day JR, Koo S, Partin AW, et al. PCA3: A molecular urine assay for predicting prostate biopsy outcome. J Urol 2008;179:1587-92. Groskopf J, Aubin SM, Deras IL, Blase A, Bodrug S, Clark C, et al. APTIMA PCA3 molecular urine test: Development of a method to aid in the diagnosis of prostate cancer. Clin Chem 2006;52:1089-95. Jones JS, Patel A, Schoenfield L, Rabets JC, Zippe CD, Magi-Galluzzi C. Saturation technique does not improve cancer detection as an initial prostate biopsy strategy. J Urol 2006;175:485-8. Delongchamps NB, Haas GP. Saturation biopsies for prostate cancer: Current uses and future prospects. Nat Rev Urol 2009;6:645-52. Efthimiou I, Skrepetis K, Bournia E. Single foci prostate cancer: Current diagnosis and management. Curr Urol 2013;7:1-6. Pepe P, Aragona F. Morbidity after transperineal prostate biopsy in 3000 patients undergoing 12 vs. 18 vs. more than 24 needle cores. Urology 2013;81:1142-6. Novella G, Ficarra V, Galfano A, Ballario R, Novara G, Cavalleri S, et al. Pain assessment after original transperineal prostate biopsy using a coaxial needle. Urology 2003;62:689-92. Caliskan S. Diagnostic efficacy of free prostate-specific antigen/total prostate-specific antigen ratio for the diagnosis of prostate cancer in low concentration (≤4 ng/ml) and intermediate levels of total prostate-specific antigen (4.01-10.0 ng/ml). J Cancer Res Ther 2017;13:279-83. Liu B, Pan TJ. Role of PSA-related variables in improving positive ratio of biopsy of prostate cancer within serum PSA gray zone. Urologia 2014;81:173-6. Mohler JL, Kantoff PW, Armstrong AJ, Bahnson RR, Cohen M, D'Amico AV, et al. Prostate cancer, version 2. 2014. J Natl Compr Canc Netw 2014;12:686-718. Elkoushy MA, Luz MA, Benidir T, Aldousari S, Aprikian AG, Andonian S, et al. Clavien classification in urology: Is there concordance among post-graduate trainees and attending urologists? Can Urol Assoc J 2013;7:179-84. Li YH, Elshafei A, Li J, Gong M, Susan L, Fareed K, et al. Transrectal saturation technique may improve cancer detection as an initial prostate biopsy strategy in men with prostate-specific antigen <10 ng/ml. Eur Urol 2014;65:1178-83. Jiang X, Zhu S, Feng G, Zhang Z, Li C, Li H, et al. Is an initial saturation prostate biopsy scheme better than an extended scheme for detection of prostate cancer? A systematic review and meta-analysis. Eur Urol 2013;63:1031-9. Numao N, Kawakami S, Sakura M, Yoshida S, Koga F, Saito K, et al. Characteristics and clinical significance of prostate cancers missed by initial transrectal 12-core biopsy. BJU Int 2012;109:665-71. Zhang FB, Shao Q, Du Y, Tian Y. Ultrasound-guided transperineal 24-core saturation prostate biopsy is superior to the 14-core scheme in detecting prostate cancer in patients with PSA <20 microg/L. Zhonghua Nan Ke Xue 2012;18:306-9. Sandhu GS, Andriole GL. Overdiagnosis of prostate cancer. J Natl Cancer Inst Monogr 2012;2012:146-51. Pepe P, Garufi A, Priolo GD, Galia A, Fraggetta F, Pennisi M. Is it time to perform only MRI targeted cores? Our experience in 1032 men submitted to prostate biopsy. J Urol 2018;200:774-8. Zhou Y, Zhou Z, Li Q, Xu Y, Sun H, Xiao Y, et al. Diagnostic accuracy of magnetic resonance-guided prostate biopsy and template-guided transperineal saturation biopsy. Medicine (Baltimore) 2018;97:e12495. Eichler K, Hempel S, Wilby J, Myers L, Bachmann LM, Kleijnen J, et al. Diagnostic value of systematic biopsy methods in the investigation of prostate cancer: A systematic review. J Urol 2006;175:1605-12.